Recent San Jose State University graduate Tiana Khong, ’17 Business Administration with a management concentration, won first place in the American National Standards Institute (ANSI) student paper competition in September. For this year’s competition, students were charged with submitting papers that exemplify the theme “The World in 2050.” In her paper, Khong envisioned a future in which international governments and technology companies have created safety-by-design service standards. The ANSI summarizes the main preface of her paper: the rise of the Internet of Things (IoT) will lead to innovative intelligence buildings, autonomous vehicles and smart roads – and these systems will increasingly rely on service safety standards to ensure optimal security for consumers and the public. As a student, Khong worked with Lucas College and Graduate School of Business Associate Professor Nitin Aggarwal and former Associate Dean Stephen Kwan. She was recognized for her paper at an awards banquet Oct. 18 in Washington D.C. and received $2,000 prize from ANSI. Since graduating in spring 2017, Khong has been working as a product support analyst for a start-up company called TeemWurk that offers software as a service-based solutions for human capital management with a special focus on employee benefits administration. In her position, she has traveled overseas, including a month-long trip to India. She works with the implementation and support services team and acts as a point of contact between the client teams and the offshore IT team, among other duties. The American National Standards Institute (ANSI) is a private non-profit organization that is engaged in enhancing U.S. global competitiveness and the American quality of life by promoting, facilitating and safeguarding the integrity of the voluntary standardization and conformity assessment systems. 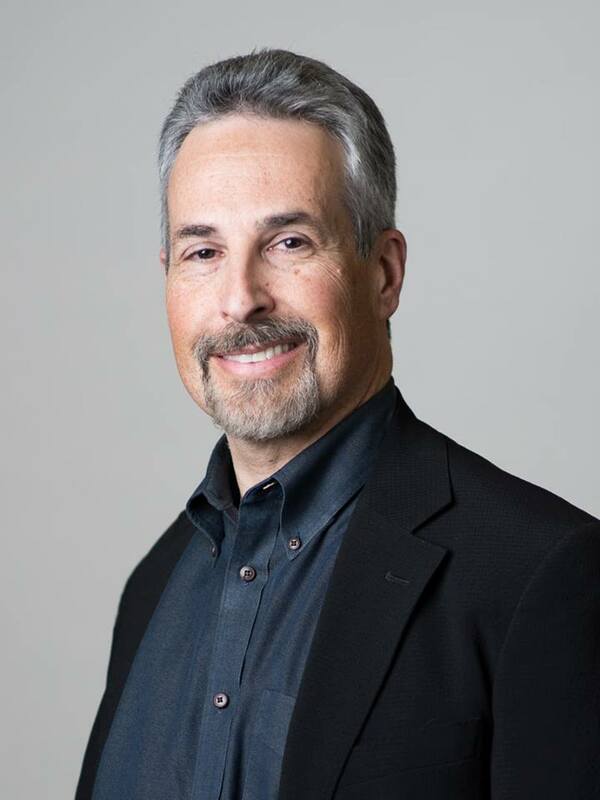 Dr. Dan Moshavi has been appointed as dean of SJSU’s Lucas College and Graduate School of Business, effective Feb. 27. Moshavi’s teaching, research and consulting has focused on leadership, change management, high performance teams, and attitudes and emotions in the workplace. He has consulted for a variety of organizations, including health care institutions, universities and municipalities. Moshavi has been a faculty member in an executive master’s program at the University of Lugano in Switzerland and has served as a research fellow at the Nemours Center for Medical Leadership. He has won more than a dozen teaching awards throughout his career, including the university-wide teaching award at Montana State. The search committee for the Dean of the Lucas College and Graduate School of Business has selected four finalists who will be visiting campus in November. Campus community members are invited to attend open forums for each of the candidates and to provide feedback on each person. Videos of each forum will be posted online following the last visit for those who are unable to attend in person. Wednesday, Nov. 2, in BBC 032, from 2 to 3 p.m.
Thursday, Nov. 3, in BBC 032, from 2 to 3 p.m.
Monday, Nov. 7, in Student Union Meeting Room 2A, from 2 to 3 p.m.
Wednesday, Nov. 9, in Student Union Meeting Room 2A, from 2 to 3 p.m.
Jyotsna Kaki, ’06 Management Information Systems, works as an accessibility software testing engineer at Google. 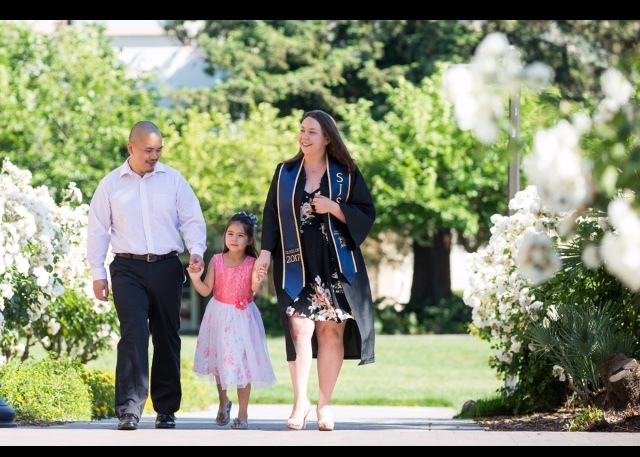 When Jyotsna Kaki, ’06 Management Information Systems (MIS), was a student at San Jose State in the Lucas College and Graduate School of Business, she offered to help a classmate in need when the other student fractured a wrist and was unable to take notes. At the time, Kaki discovered the Disability Resource Center (DRC), now known as the Accessible Education Center, where staff members provided her guidance on how to best support her peer. 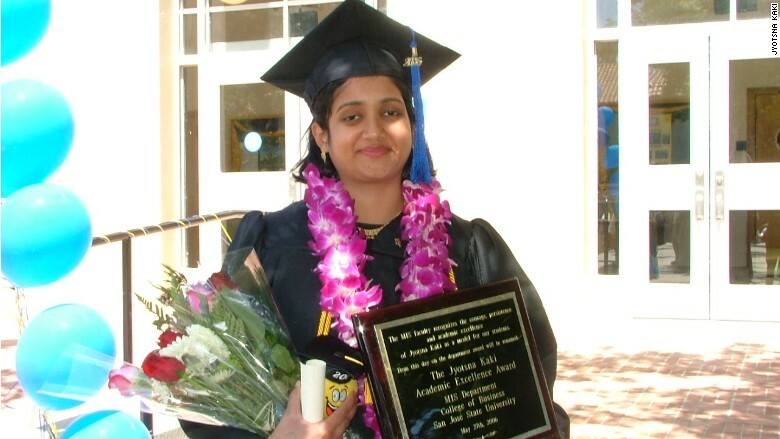 More than a decade later, Kaki, who became blind while she was a student at SJSU, is still helping others as a software accessibility test engineer for Google. She oversees a central accessibility team of test engineers and trains other Google employees to conduct accessibility testing. Her story was recently featured on CNN Money, with a video and article. Kaki became blind a semester after she discovered the DRC while helping her classmate. In fall 2004, she woke one morning with blurriness in her right eye. She had been diagnosed with a benign, slow-growing brain tumor as a child. The tumor had grown into the optic nerve and she underwent surgery to regain her sight. Instead, her optic nerve was damaged during the surgery and she was left with a permanent visual impairment. But her mother tells her less than 10 minutes after discovering she was blind, Kaki called her brother to ask him to help her get back on campus. 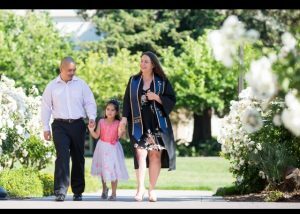 Within a month, she was back at San Jose State. When she returned to campus, she felt isolated from her peers who did not interact with her as they had before she lost her vision. Her professors tried to be accommodating, but sometimes did not know how to help her. She turned to the DRC for support. They provided training on how to use screen reading technology, helped her get accessible textbooks and she learned Braille to get through the rest of her coursework. Kaki completed her degree two years after she lost her vision with a 3.8 GPA, higher than her GPA before her impairment. After graduation, her brother passed her resume to a friend who worked at Google without telling her. She thought a professor might have sent her resume in, but later discovered it was her brother. When she was invited in for an interview, she did not think she would get the job. They offered her a position and she has since taken on the role of leading a team of engineers. In the last decade, she said she has seen the focus on accessibility increase at Google and she is proud to be part of the efforts. 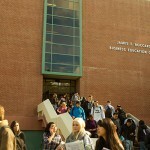 Students exit the Boccardo Business Center at San Jose State. After a thorough review and onsite visit, the Association to Advance Collegiate Schools of Business board members voted to extend the Lucas College and Graduate School of Business’ accreditation. SJSU’s Lucas College and Graduate School of Business is home to multiple centers and institutes including the Mineta Transportation Institute, the Silicon Valley Center for Entrepreneurship, High Technology Tax Institute, and the Silicon Valley Center for Operations and Technology Management, among others. 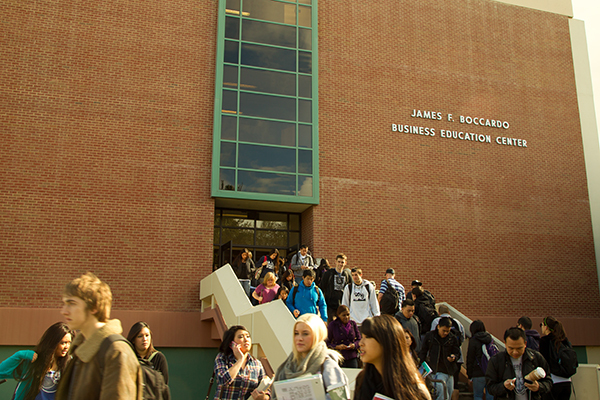 The college serves more than 5,000 undergraduate and graduate students in five departments and schools. The accreditation process was supported by the College Accreditation Steering Committee: Carol Reade, director of Accreditation; Camille Johnson, co-director of Accreditation; Mary Calegari, faculty in accounting and former director of accreditation; Annette Nellen, faculty in tax and former director of faculty development; Malu Roldan, associate dean, Undergraduate Programs; Stephen Kwan, associate dean, Lucas Graduate School of Business; and Thalia Anagnos, AVP, Graduate and Undergraduate Programs.